I thought it was today, the 28th but it was actually yesterday. Born November 27, 1940, Bruce Lee was not only a dragon in the Chinese zodiac but he was also a Sagittarian in our zodiac. That makes him a double fire sign! Here’s a little bit about his life followed with a link to learn more: In a lifetime comprising a mere 32 years, Bruce Lee revolutionized the world of martial arts through his profound teachings and philosophy, and created a legacy through his work in motion pictures, that has evolved into a Legend. Thought by many to be the ‘Greatest martial artist of the 20th Century’, Bruce Lee was born in San Francisco on November 27th 1940, between 6:00am and 8:00am, at the Jackson Street Hospital, under the birth name of ‘Lee Jun Fan’. Courtesy of his thespian father, young Bruce made his stage debut at the tender age of three months, playing the role of a female baby. His father Lee Hoi Chuen, a prestigious member of ‘The Cantonese Opera Company’, would carry his young son on stage each night, during his performance of “Golden Gate Girl”. In 1941, when Bruce was only 1 year old, he returned with his parents to the family home in Kowloon, Hong Kong. The modest second-storey apartment, at 218 Nathan Road, would be Bruce’s home for most of his formative years. By age six, Bruce had already begun to develop the charisma and confidence that would later make him a star, and he appeared in his first major childhood movie, “The Beginning of a Boy” in 1946. Later in the same year, Bruce performed in “The Birth of Mankind” and “My Son, Ah Cheun” and went on to make over 20 movies, before commencing his studies at “La Salle College” in 1952. 1953 was a pivotal year in the life of Bruce Lee. 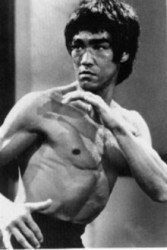 After losing a street fight with a local gang, Bruce began to train in the art of Wing Chun under famed Sifu, Yip Man. His natural speed and timing, and acute mental focus, guaranteed that Bruce would excel in this complex and exacting art. In fact his precocious talent developed so quickly, that despite numerous other encounters with street gangs, Bruce would never again lose a fight. As well as indulging his passion for the martial arts, Bruce also began taking Cha Cha lessions in 1954, at age fourteen. The dance was popular amongst local teenagers at the time, and Bruce not only went on to win the ‘Crown Colony Cha-Cha Championship’ in 1958, but also broke the hearts of many local girls. As well as his achievements on the dance-floor, ‘58 is also notable as the year when Bruce defeated reigning three year champion, Gary Elms, in the Hong Kong Boxing Championships, putting to practical use the combat theory he had devised with Sifu Yip Man. Like many Hong Kong teenagers of the time, Bruce became caught up in the ‘turf wars’ which surrounded the illicit activities of the local street-gangs. Participating in numerous street-fighting incidents, Bruce soon came to the attention of the police. Terrified that their son would forever become embroiled in a life of crime, Bruce’s mother and father, decided that he should visit San Francisco, the place of his birth, to claim his American Citizenship and finish his education. With only fifteen dollars from his father and one hundred dollars from his mother, Bruce arrives in the United States in 1959, and stays, by prior arrangement, with an old friend of his father. By carrying out odd jobs around the Chinese Communities in the San Francisco Bay area, Bruce earns just enough money to secure his independence within a few months, and relocates to Seattle (Washington) to begin work as a waiter in Ruby Chow’s famous Chinatown restaurant. Mindful of the promise he made to his parents, Bruce enrols at the ‘Edison Technical School’ and through diligent study and application earns his high school diploma, while supplementing his income from the restaurant by teaching martial arts to local residents in backyards and city parks. To me he was a dynamic, fascinating human being. To learn more about him, visit this site.